Thick leathery stems with lavender blue flowers and glossy dark green foliage. Unique blooms in late summer look like a little hood. Flowers have strong stems that do not require staking. 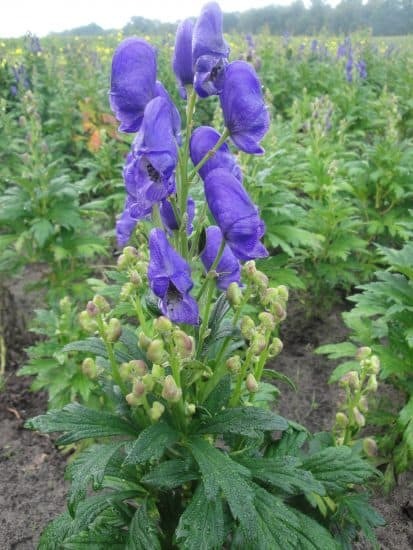 Aconitum prefers partial shade but will tolerate full sun if plenty of moisture is available; dry soil can stunt growth. Aconitums are highly resistant to diseases and pests, partially because they are very poisonous. Monkshood plants prefer climates with cool summer nights and warm days with low humidity. Plant in fertile, humus-rich, moist but well-drained soil. Crowns will rot if soil is wet and temperatures are hot. Site properly to avoid problems. Mature Monkshood plants dislike disturbance once established, however, crowns may be divided in fall or early spring. Replant strong, healthy divisions into soil that has been enriched with organic matter.